End of Term 2016 Web Archive government web crawls by project partner the University of North Texas. The eutrophication of the Potomac River is evident from the bright green water, caused by a dense bloom of cyanobacteria. Eutrophication (Greek: eutrophia (from eu "well" + trephein "nourish". ); German: Eutrophie), or more precisely hypertrophication, is the depletion of oxygen in a water body, which kills aquatic animals. It is a response to the addition of excess nutrients, mainly phosphates, which induces explosive growth of plants and algae, the decaying of which consumes oxygen from the water. One example is the "bloom" or great increase of phytoplankton in a water body as a response to increased levels of nutrients. Eutrophication is almost always induced by the discharge of phosphate-containing detergents, fertilizers, or sewage, into an aquatic system. Eutrophication arises from the oversupply of nutrients, which leads to over growth of plants and algae. After such organisms die, the bacterial degradation of their biomass consumes the oxygen in the water, thereby creating the state of hypoxia. According to Ullmann's Encyclopedia, "the primary limiting factor for eutrophication is phosphate." The availability of phosphorus generally promotes excessive plant growth and decay, favouring simple algae and plankton over other more complicated plants, and causes a severe reduction in water quality. Phosphorus is a necessary nutrient for plants to live, and is the limiting factor for plant growth in many freshwater ecosystems. Phosphate adheres tightly to soil, so it is mainly transported by erosion. Once translocated to lakes, the extraction of phosphate into water is slow, hence the difficulty of reversing the effects of eutrophication. The sources of these excess phosphates are detergents, industrial/domestic run-offs, and fertilizers. With the phasing out of phosphate-containing detergents in the 1970s, industrial/domestic run-off and agriculture have emerged as the dominant contributors to eutrophication. Sodium triphosphate, once a component of many detergents, was a major contributor to eutrophication. 1. Excess nutrients are applied to the soil. 2. Some nutrients leach into the soil where they can remain for years. Eventually, they get drained into the water body. 3. Some nutrients run off over the ground into the body of water. 4. The excess nutrients cause an algal bloom. 5. The algal bloom blocks the light of the sun from reaching the bottom of the water body. 6. The plants beneath the algal bloom die because they cannot get sunlight to photosynthesize. 7. Eventually, the algal bloom dies and sinks to the bottom of the lake. Bacteria begins to decompose the remains, using up oxygen for respiration. 8. The decomposition causes the water to become depleted of oxygen. Larger life forms, such as fish, suffocate to death. This body of water can no longer support life. When algae die, they decompose and the nutrients contained in that organic matter are converted into inorganic form by microorganisms. This decomposition process consumes oxygen, which reduces the concentration of dissolved oxygen. The depleted oxygen levels in turn may lead to fish kills and a range of other effects reducing biodiversity. 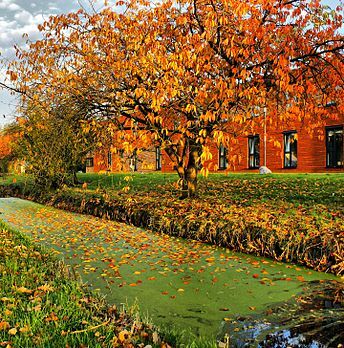 Nutrients may become concentrated in an anoxic zone and may only be made available again during autumn turn-over or in conditions of turbulent flow. Enhanced growth of aquatic vegetation or phytoplankton and algal blooms disrupts normal functioning of the ecosystem, causing a variety of problems such as a lack of oxygen needed for fish and shellfish to survive. The water becomes cloudy, typically coloured a shade of green, yellow, brown, or red. Eutrophication also decreases the value of rivers, lakes and aesthetic enjoyment. Health problems can occur where eutrophic conditions interfere with drinking water treatment. Human activities can accelerate the rate at which nutrients enter ecosystems. Runoff from agriculture and development, pollution from septic systems and sewers, sewage sludge spreading, and other human-related activities increase the flow of both inorganic nutrients and organic substances into ecosystems. Elevated levels of atmospheric compounds of nitrogen can increase nitrogen availability. 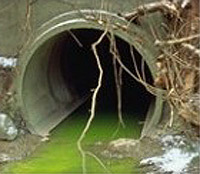 Phosphorus is often regarded as the main culprit in cases of eutrophication in lakes subjected to "point source" pollution from sewage pipes. The concentration of algae and the trophic state of lakes correspond well to phosphorus levels in water. Studies conducted in the Experimental Lakes Area in Ontario have shown a relationship between the addition of phosphorus and the rate of eutrophication. Humankind has increased the rate of phosphorus cycling on Earth by four times, mainly due to agricultural fertilizer production and application. Between 1950 and 1995, an estimated 600,000,000 tonnes of phosphorus was applied to Earth's surface, primarily on croplands. Policy changes to control point sources of phosphorus have resulted in rapid control of eutrophication. Although eutrophication is commonly caused by human activities, it can also be a natural process, particularly in lakes. Eutrophy occurs in many lakes in temperate grasslands, for instance. Paleolimnologists now recognise that climate change, geology, and other external influences are critical in regulating the natural productivity of lakes. Some lakes also demonstrate the reverse process (meiotrophication), becoming less nutrient rich with time. The main difference between natural and anthropogenic eutrophication is that the natural process is very slow, occurring on geological time scales. Eutrophication is a common phenomenon in coastal waters. In contrast to freshwater systems, nitrogen is more commonly the key limiting nutrient of marine waters; thus, nitrogen levels have greater importance to understanding eutrophication problems in salt water. Estuaries tend to be naturally eutrophic because land-derived nutrients are concentrated where run-off enters a confined channel. Upwelling in coastal systems also promotes increased productivity by conveying deep, nutrient-rich waters to the surface, where the nutrients can be assimilated by algae. The World Resources Institute has identified 375 hypoxic coastal zones in the world, concentrated in coastal areas in Western Europe, the Eastern and Southern coasts of the US, and East Asia, particularly Japan. In addition to runoff from land, atmospheric fixed nitrogen can enter the open ocean. A study in 2008 found that this could account for around one third of the ocean's external (non-recycled) nitrogen supply, and up to 3% of the annual new marine biological production. It has been suggested that accumulating reactive nitrogen in the environment may prove as serious as putting carbon dioxide in the atmosphere. Terrestrial ecosystems are subject to similarly adverse impacts from eutrophication. Increased nitrates in soil are frequently undesirable for plants. Many terrestrial plant species are endangered as a result of soil eutrophication, such as the majority of orchid species in Europe. Meadows, forests, and bogs are characterized by low nutrient content and slowly growing species adapted to those levels, so they can be overgrown by faster growing and more competitive species. In meadows, tall grasses that can take advantage of higher nitrogen levels may change the area so that natural species may be lost. Species-rich fens can be overtaken by reed or reedgrass species. Forest undergrowth affected by run-off from a nearby fertilized field can be turned into a nettle and bramble thicket. Chemical forms of nitrogen are most often of concern with regard to eutrophication, because plants have high nitrogen requirements so that additions of nitrogen compounds will stimulate plant growth. Nitrogen is not readily available in soil because N2, a gaseous form of nitrogen, is very stable and unavailable directly to higher plants. Terrestrial ecosystems rely on microbial nitrogen fixation to convert N2 into other forms such as nitrates. However, there is a limit to how much nitrogen can be utilized. Ecosystems receiving more nitrogen than the plants require are called nitrogen-saturated. Saturated terrestrial ecosystems then can contribute both inorganic and organic nitrogen to freshwater, coastal, and marine eutrophication, where nitrogen is also typically a limiting nutrient. This is also the case with increased levels of phosphorus. However, because phosphorus is generally much less soluble than nitrogen, it is leached from the soil at a much slower rate than nitrogen. Consequently, phosphorus is much more important as a limiting nutrient in aquatic systems. 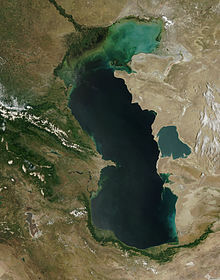 Eutrophication is apparent as increased turbidity in the northern part of the Caspian Sea, imaged from orbit. Eutrophication was recognized as a water pollution problem in European and North American lakes and reservoirs in the mid-20th century. Since then, it has become more widespread. Surveys showed that 54% of lakes in Asia are eutrophic; in Europe, 53%; in North America, 48%; in South America, 41%; and in Africa, 28%. Many ecological effects can arise from stimulating primary production, but there are three particularly troubling ecological impacts: decreased biodiversity, changes in species composition and dominance, and toxicity effects. When an ecosystem experiences an increase in nutrients, primary producers reap the benefits first. In aquatic ecosystems, species such as algae experience a population increase (called an algal bloom). Algal blooms limit the sunlight available to bottom-dwelling organisms and cause wide swings in the amount of dissolved oxygen in the water. Oxygen is required by all aerobically respiring plants and animals and it is replenished in daylight by photosynthesizing plants and algae. Under eutrophic conditions, dissolved oxygen greatly increases during the day, but is greatly reduced after dark by the respiring algae and by microorganisms that feed on the increasing mass of dead algae. When dissolved oxygen levels decline to hypoxic levels, fish and other marine animals suffocate. As a result, creatures such as fish, shrimp, and especially immobile bottom dwellers die off. In extreme cases, anaerobic conditions ensue, promoting growth of bacteria such as Clostridium botulinum that produces toxins deadly to birds and mammals. Zones where this occurs are known as dead zones. Eutrophication may cause competitive release by making abundant a normally limiting nutrient. This process causes shifts in the species composition of ecosystems. For instance, an increase in nitrogen might allow new, competitive species to invade and out-compete original inhabitant species. This has been shown to occur in New England salt marshes. In Europe and Asia, the Common carp frequently lives in naturally Eutrophic or Hypereutrophic areas, and is adapted to living in such conditions. The eutrophication of areas outside its natural range partially explain the fish's success in colonising these areas after being introduced. Some algal blooms, otherwise called "nuisance algae" or "harmful algal blooms", are toxic to plants and animals. Toxic compounds they produce can make their way up the food chain, resulting in animal mortality. Freshwater algal blooms can pose a threat to livestock. When the algae die or are eaten, neuro- and hepatotoxins are released which can kill animals and may pose a threat to humans. An example of algal toxins working their way into humans is the case of shellfish poisoning. Biotoxins created during algal blooms are taken up by shellfish (mussels, oysters), leading to these human foods acquiring the toxicity and poisoning humans. Examples include paralytic, neurotoxic, and diarrhoetic shellfish poisoning. Other marine animals can be vectors for such toxins, as in the case of ciguatera, where it is typically a predator fish that accumulates the toxin and then poisons humans. In order to gauge how to best prevent eutrophication from occurring, specific sources that contribute to nutrient loading must be identified. There are two common sources of nutrients and organic matter: point and nonpoint sources. Point sources are directly attributable to one influence. In point sources the nutrient waste travels directly from source to water. Point sources are relatively easy to regulate. Nonpoint source pollution (also known as 'diffuse' or 'runoff' pollution) is that which comes from ill-defined and diffuse sources. Nonpoint sources are difficult to regulate and usually vary spatially and temporally (with season, precipitation, and other irregular events). Nutrients from human activities tend to accumulate in soils and remain there for years. It has been shown that the amount of phosphorus lost to surface waters increases linearly with the amount of phosphorus in the soil. Thus much of the nutrient loading in soil eventually makes its way to water. Nitrogen, similarly, has a turnover time of decades. Nutrients from human activities tend to travel from land to either surface or ground water. Nitrogen in particular is removed through storm drains, sewage pipes, and other forms of surface runoff. Nutrient losses in runoff and leachate are often associated with agriculture. Modern agriculture often involves the application of nutrients onto fields in order to maximise production. However, farmers frequently apply more nutrients than are taken up by crops or pastures. Regulations aimed at minimising nutrient exports from agriculture are typically far less stringent than those placed on sewage treatment plants and other point source polluters. It should be also noted that lakes within forested land are also under surface runoff influences. Runoff can wash out the mineral nitrogen and phosphorus from detritus and in consequence supply the water bodies leading to slow, natural eutrophication. Nitrogen is released into the air because of ammonia volatilization and nitrous oxide production. The combustion of fossil fuels is a large human-initiated contributor to atmospheric nitrogen pollution. Atmospheric deposition (e.g., in the form of acid rain) can also affect nutrient concentration in water, especially in highly industrialized regions. Any factor that causes increased nutrient concentrations can potentially lead to eutrophication. In modeling eutrophication, the rate of water renewal plays a critical role; stagnant water is allowed to collect more nutrients than bodies with replenished water supplies. It has also been shown that the drying of wetlands causes an increase in nutrient concentration and subsequent eutrophication blooms. Eutrophication poses a problem not only to ecosystems, but to humans as well. Reducing eutrophication should be a key concern when considering future policy, and a sustainable solution for everyone, including farmers and ranchers, seems feasible. While eutrophication does pose problems, humans should be aware that natural runoff (which causes algal blooms in the wild) is common in ecosystems and should thus not reverse nutrient concentrations beyond normal levels. Cleanup measures have been mostly, but not completely, successful. Finnish phosphorus removal measures started in the mid-1970s and have targeted rivers and lakes polluted by industrial and municipal discharges. These efforts have had a 90% removal efficiency. Still, some targeted point sources did not show a decrease in runoff despite reduction efforts. One proposed solution to eutrophication in estuaries is to restore shellfish populations, such as oysters and mussels. Oyster reefs remove nitrogen from the water column and filter out suspended solids, subsequently reducing the likelihood or extent of harmful algal blooms or anoxic conditions. Filter feeding activity is considered beneficial to water quality by controlling phytoplankton density and sequestering nutrients, which can be removed from the system through shellfish harvest, buried in the sediments, or lost through denitrification. Foundational work toward the idea of improving marine water quality through shellfish cultivation was conducted by Odd Lindahl et al., using mussels in Sweden. In the United States, shellfish restoration projects have been conducted on the East, West and Gulf coasts. See nutrient pollution for an extended explanation of nutrient remediation using shellfish. Nonpoint pollution is the most difficult source of nutrients to manage. The literature suggests, though, that when these sources are controlled, eutrophication decreases. The following steps are recommended to minimize the amount of pollution that can enter aquatic ecosystems from ambiguous sources. Studies show that intercepting non-point pollution between the source and the water is a successful means of prevention. Riparian buffer zones are interfaces between a flowing body of water and land, and have been created near waterways in an attempt to filter pollutants; sediment and nutrients are deposited here instead of in water. Creating buffer zones near farms and roads is another possible way to prevent nutrients from traveling too far. Still, studies have shown that the effects of atmospheric nitrogen pollution can reach far past the buffer zone. This suggests that the most effective means of prevention is from the primary source. Laws regulating the discharge and treatment of sewage have led to dramatic nutrient reductions to surrounding ecosystems, but it is generally agreed that a policy regulating agricultural use of fertilizer and animal waste must be imposed. In Japan the amount of nitrogen produced by livestock is adequate to serve the fertilizer needs for the agriculture industry. Thus, it is not unreasonable to command livestock owners to clean up animal waste—which when left stagnant will leach into ground water. Policy concerning the prevention and reduction of eutrophication can be broken down into four sectors: Technologies, public participation, economic instruments, and cooperation. The term technology is used loosely, referring to a more widespread use of existing methods rather than an appropriation of new technologies. As mentioned before, nonpoint sources of pollution are the primary contributors to eutrophication, and their effects can be easily minimized through common agricultural practices. Reducing the amount of pollutants that reach a watershed can be achieved through the protection of its forest cover, reducing the amount of erosion leeching into a watershed. Also, through the efficient, controlled use of land using sustainable agricultural practices to minimize land degradation, the amount of soil runoff and nitrogen-based fertilizers reaching a watershed can be reduced. Waste disposal technology constitutes another factor in eutrophication prevention. Because a major contributor to the nonpoint source nutrient loading of water bodies is untreated domestic sewage, it is necessary to provide treatment facilities to highly urbanized areas, particularly those in underdeveloped nations, in which treatment of domestic waste water is a scarcity. The technology to safely and efficiently reuse waste water, both from domestic and industrial sources, should be a primary concern for policy regarding eutrophication. The role of the public is a major factor for the effective prevention of eutrophication. In order for a policy to have any effect, the public must be aware of their contribution to the problem, and ways in which they can reduce their effects. Programs instituted to promote participation in the recycling and elimination of wastes, as well as education on the issue of rational water use are necessary to protect water quality within urbanized areas and adjacent water bodies. Economic instruments, "which include, among others, property rights, water markets, fiscal and financial instruments, charge systems and liability systems, are gradually becoming a substantive component of the management tool set used for pollution control and water allocation decisions." Incentives for those who practice clean, renewable, water management technologies are an effective means of encouraging pollution prevention. By internalizing the costs associated with the negative effects on the environment, governments are able to encourage a cleaner water management. Because a body of water can have an effect on a range of people reaching far beyond that of the watershed, cooperation between different organizations is necessary to prevent the intrusion of contaminants that can lead to eutrophication. Agencies ranging from state governments to those of water resource management and non-governmental organizations, going as low as the local population, are responsible for preventing eutrophication of water bodies. In the United States, the most well known inter-state effort to prevent eutrophication is the Chesapeake Bay. Soil Nitrogen Testing (N-Testing) is a technique that helps farmers optimize the amount of fertilizer applied to crops. By testing fields with this method, farmers saw a decrease in fertilizer application costs, a decrease in nitrogen lost to surrounding sources, or both. By testing the soil and modeling the bare minimum amount of fertilizer needed, farmers reap economic benefits while reducing pollution. There has been a study that found that organically fertilized fields "significantly reduce harmful nitrate leaching" over conventionally fertilized fields. However, a more recent study found that eutrophication impacts are in some cases higher from organic production than they are from conventional production. Cultural eutrophication is the process that speeds up natural eutrophication because of human activity. Due to clearing of land and building of towns and cities, land runoff is accelerated and more nutrients such as phosphates and nitrate are supplied to lakes and rivers, and then to coastal estuaries and bays. Extra nutrients are also supplied by treatment plants, golf courses, fertilizers, and farms. These nutrients result in an excessive growth of plant life known as an algal bloom. This can change a lake's natural food web, and also reduce the amount of dissolved oxygen in the water for organisms to breathe. Both these things cause animal and plant death rates to increase as the plants take in poisonous water while the animals drink the poisoned water. This contaminates water, making it undrinkable, and sediment quickly fills the lake. Cultural eutrophication is a form of water pollution. Cultural eutrophication also occurs when excessive fertilizers run into lakes and rivers. This encourages the growth of algae (algal bloom) and other aquatic plants. Following this, overcrowding occurs and plants compete for sunlight, space and oxygen. Overgrowth of water plants also blocks sunlight and oxygen for aquatic life in the water, which in turn threatens their survival. Algae also grows easily, thus threatening other water plants no matter whether they are floating, half-submerged, or fully submerged. Not only does this cause algal blooming, it can cause an array of more long-term effects on the water such as damage to coral reefs and deep sea animal life. It also speeds up the damage of both marine and also affects humans if the effects of algal blooming is too drastic. Fish will die and there will be lack of food in the area. Nutrient pollution is a major cause of algal blooming, and should be minimized. ^ a b c d Carpenter, S.R. ; Caraco, N.F. ; Smith, V.H. (1998). "Nonpoint pollution of surface waters with phosphorus and nitrogen". Ecological Applications. 8 (3): 559–568. doi:10.2307/2641247. JSTOR 2641247. ^ Whiteside, M. C. (1983). "The mythical concept of eutrophication". Hydrobiologia. 103: 107–150. doi:10.1007/BF00028437. ^ Selman, Mindy (2007) Eutrophication: An Overview of Status, Trends, Policies, and Strategies. World Resources Institute. ^ Duce, R A; et al. (2008). "Impacts of Atmospheric Anthropogenic Nitrogen on the Open Ocean". Science. 320: 893–89. doi:10.1126/science.1150369. PMID 18487184. ^ Addressing the nitrogen cascade Eureka Alert, 2008. ^ APIS (2005) Air Pollution Information System. ^ Pullin, Andrew S. (2002). Conservation biology. Cambridge University Press. ISBN 0-521-64482-8. ^ Hornung M., Sutton M.A. and Wilson R.B. [Eds.] (1995): Mapping and modelling of critical loads for nitrogen — a workshop report. Grange-over-Sands, Cumbria, UK. UN-ECE Convention on Long Range Transboundary Air Pollution, Working Group for Effects, 24–26 October 1994. Published by: Institute of Terrestrial Ecology, Edinburgh, UK. ^ a b c Smith, V. H.; Tilman, G. D.; Nekola, J. C. (1999). "Eutrophication: Impacts of excess nutrient inputs on freshwater, marine, and terrestrial ecosystems". Environmental pollution (Barking, Essex : 1987). 100 (1–3): 179–196. doi:10.1016/S0269-7491(99)00091-3. PMID 15093117. ^ Rodhe, W. 1969 Crystallization of eutrophication concepts in North Europe. In: Eutrophication, Causes, Consequences, Correctives. National Academy of Sciences, Washington D.C., ISBN 9780309017008 , pp. 50–64. ^ ILEC/Lake Biwa Research Institute [Eds]. 1988–1993 Survey of the State of the World's Lakes. Volumes I-IV. International Lake Environment Committee, Otsu and United Nations Environment Programme, Nairobi. ^ Horrigan, L.; Lawrence, R. S.; Walker, P. (2002). "How sustainable agriculture can address the environmental and human health harms of industrial agriculture". Environmental Health Perspectives. 110 (5): 445–456. doi:10.1289/ehp.02110445. PMC 1240832 . PMID 12003747. ^ Anderson D. M. (1994). "Red tides" (PDF). Scientific American. 271 (2): 62–68. doi:10.1038/scientificamerican0894-62. PMID 8066432. ^ Lawton, L.A.; G.A. Codd (1991). "Cyanobacterial (blue-green algae) toxins and their significance in UK and European waters". Journal of Soil and Water Conservation. 40: 87–97. ^ Martin, A.; G.D. Cooke (1994). "Health risks in eutrophic water supplies". Lake Line. 14: 24–26. ^ Shumway, S. E. (1990). "A Review of the Effects of Algal Blooms on Shellfish and Aquaculture". Journal of the World Aquaculture Society. 21 (2): 65–10. doi:10.1111/j.1749-7345.1990.tb00529.x. ^ Cole J.J., B.L. Peierls, N.F. Caraco, and M.L. Pace. (1993) "Nitrogen loading of rivers as a human-driven process", pp. 141–157 in M. J. McDonnell and S.T.A. Pickett (eds.) Humans as components of ecosystems. Springer-Verlag, New York, New York, USA, ISBN 0-387-98243-4. ^ Howarth, R. W.; Billen, G.; Swaney, D.; Townsend, A.; Jaworski, N.; Lajtha, K.; Downing, J. A.; Elmgren, R.; Caraco, N.; Jordan, T.; Berendse, F.; Freney, J.; Kudeyarov, V.; Murdoch, P.; Zhao-Liang, Zhu (1996). "Regional nitrogen budgets and riverine inputs of N and P for the drainages to the North Atlantic Ocean: natural and human influences" (PDF). Biogeochemistry. 35: 75–139. doi:10.1007/BF02179825. ^ Buol, S. W. (1995). "Sustainability of Soil Use". Annual Review of Ecology and Systematics. 26: 25–22. doi:10.1146/annurev.es.26.110195.000325. ^ Klimaszyk, P.; Rzymski, P. (2010). "Surface Runoff as a Factor Determining Trophic State of Midforest Lake". Polish Journal of Environmental Studies. 20 (5): 1203–1210. ^ Paerl H. W. (1997). "Coastal Eutrophication and Harmful Algal Blooms: Importance of Atmospheric Deposition and Groundwater as "New" Nitrogen and Other Nutrient Sources" (PDF). Limnology and Oceanography. 42 (5_part_2): 1154–1165. doi:10.4319/lo.1997.42.5_part_2.1154. ^ Mungall C. and McLaren, D.J. (1991) Planet under stress: the challenge of global change. Oxford University Press, New York, New York, USA, ISBN 0-19-540731-8. ^ Räike, A.; Pietiläinen, O. -P.; Rekolainen, S.; Kauppila, P.; Pitkänen, H.; Niemi, J.; Raateland, A.; Vuorenmaa, J. (2003). "Trends of phosphorus, nitrogen and chlorophyll a concentrations in Finnish rivers and lakes in 1975–2000". Science of the Total Environment. 310 (1–3): 47–59. doi:10.1016/S0048-9697(02)00622-8. PMID 12812730. ^ Kroeger, Timm (2012) Dollars and Sense: Economic Benefits and Impacts from two Oyster Reef Restoration Projects in the Northern Gulf of Mexico. TNC Report. ^ Burkholder, JoAnn M. and Sandra E. Shumway. (2011) "Bivalve shellfish aquaculture and eutrophication", in Shellfish Aquaculture and the Environment. Ed. Sandra E. Shumway. John Wiley & Sons, ISBN 0-8138-1413-8. ^ Kaspar, H. F.; Gillespie, P. A.; Boyer, I. C.; MacKenzie, A. L. (1985). "Effects of mussel aquaculture on the nitrogen cycle and benthic communities in Kenepuru Sound, Marlborough Sounds, New Zealand". Marine Biology. 85 (2): 127–136. doi:10.1007/BF00397431. ^ Newell, R. I. E.; Cornwell, J. C.; Owens, M. S. (2002). "Influence of simulated bivalve biodeposition and microphytobenthos on sediment nitrogen dynamics: A laboratory study". Limnology and Oceanography. 47 (5): 1367–1379. doi:10.4319/lo.2002.47.5.1367. ^ Lindahl, O.; Hart, R.; Hernroth, B.; Kollberg, S.; Loo, L. O.; Olrog, L.; Rehnstam-Holm, A. S.; Svensson, J.; Svensson, S.; Syversen, U. (2005). "Improving marine water quality by mussel farming: A profitable solution for Swedish society". Ambio. 34 (2): 131–138. doi:10.1579/0044-7447-34.2.131. PMID 15865310. ^ Brumbaugh, R.D. et al. (2006). A Practitioners Guide to the Design and Monitoring of Shellfish Restoration Projects: An Ecosystem Services Approach. The Nature Conservancy, Arlington, VA.
^ Angold P. G. (1997). "The Impact of a Road Upon Adjacent Heathland Vegetation: Effects on Plant Species Composition". The Journal of Applied Ecology. 34 (2): 409–417. doi:10.2307/2404886. JSTOR 2404886. ^ Kumazawa, K. (2002). "Nitrogen fertilization and nitrate pollution in groundwater in Japan: Present status and measures for sustainable agriculture". Nutrient Cycling in Agroecosystems. 63 (2/3): 129–137. doi:10.1023/A:1021198721003. ^ a b "Planning and Management of Lakes and Reservoirs: An Integrated Approach to Eutrophication." United Nations Environment Programme, Newsletter and Technical Publications. International Environmental Technology Centre. Ch.3.4 (2000). ^ Oglesby, R. T.; Edmondson, W. T. (1966). "Control of Eutrophication". Journal (Water Pollution Control Federation). 38 (9): 1452–1460. JSTOR 25035632. ^ Middlebrooks, E. J.; Pearson, E. A.; Tunzi, M.; Adinarayana, A.; McGauhey, P. H.; Rohlich, G. A. (1971). "Eutrophication of Surface Water: Lake Tahoe". Journal (Water Pollution Control Federation). 43 (2): 242–251. JSTOR 25036890. ^ Huang, Wen-Yuan; Lu, Yao-chi; Uri, Noel D. (2001). "An assessment of soil nitrogen testing considering the carry-over effect". Applied Mathematical Modelling. 25 (10): 843–860. doi:10.1016/S0307-904X(98)10001-X. ^ Kramer, S. B. (2006). "Reduced nitrate leaching and enhanced denitrifier activity and efficiency in organically fertilized soils". Proceedings of the National Academy of Sciences. 103 (12): 4522–4527. Bibcode:2006PNAS..103.4522K. doi:10.1073/pnas.0600359103. PMC 1450204 . PMID 16537377. ^ Williams, A.G., Audsley, E. and Sandars, D.L. (2006) Determining the environmental burdens and resource use in the production of agricultural and horticultural commodities. Main Report. Defra Research Project IS0205. Bedford: Cranfield University and Defra. ^ Schindler, David William (2009). "A personal history of the Experimental Lakes Project" (PDF). Canadian Journal of Fisheries and Aquatic Sciences. 66 (11): 1837–1847. doi:10.1139/f09-134. ^ Schindler, David W., Vallentyne, John R. (2008). The Algal Bowl: Overfertilization of the World's Freshwaters and Estuaries, University of Alberta Press, ISBN 0-88864-484-1. 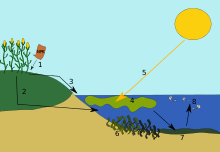 Look up eutrophication in Wiktionary, the free dictionary. This page was last modified on 3 January 2017, at 15:58.